Committee members are busy people. They volunteer their time and attention to the greater good of participating in Owners Corporation decisions in between annual general meetings. Committees often have to deal with complex repair projects or legal disputes in the evenings or weekends when they are not working at their paid jobs. Owners Corporation managers are busy people too. They often manage many properties, and dealing with an important issue for one Owners Corporation client can mean less attention in the mean time for others. So, when an Owners Corporation needs legal advice about how to deal with an important issue, the last thing that committees and managers need is a 10-page bland letter of advice full of rarely used words in the English language that will take them several precious hours to digest. There is not much value in legal advice that is never read. The team at Tisher liner FC Law continue to provide easy to understand legal advice presented in plain, everyday language. In 2019, we are going to take it one step further. Using colour, diagrams, pictures and key summaries makes legal advice user-friendly and it’s what our Owners Corporation clients continue to ask for and value. We can provide you with some examples. We’re not afraid to highlight. In our letters of advice we include highlighted executive summaries making them easy to identify and visually digest. The executive summary succinctly identifies your options and is a great tool to refer back to as you work through the advice in full. As you read through the advice you will see we have colour coordinated the important options, points of law, and elements such as areas of the property that you may have originally referred to in your request for advice. A picture is worth 1000 words. Most committees are more familiar with a floor plan than any amount of legal jargon we can throw at you. Many of your issues directly relate to your buildings. While a great deal of our advice refers directly to physical issues, not a lot of it provide any reference to the spaces or issues that you need resolving. Our advice includes diagrammatic floor plans sections or photos to clearly show the real impact of the solution. For example, we recently provided advice to an Owners Corporation giving two options for how to rectify property damage. In the advice, it was important to identify from the affected area (red) what was common property (yellow) and what was private lot property (green). We highlighted those areas in diagrams similar to the ones below. Private lot owners are responsible for property work within their private lot, owners corporations are generally required to repair areas that fall within common property. The cost per square meter can be determined down to the surface of the wall or floor affected by the damage. 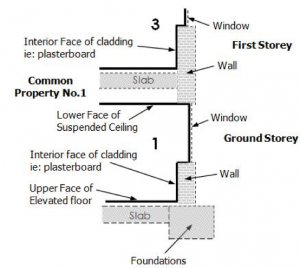 In order to understand that, we provide diagrams such as those found in the Subdivision (Registrar’s Requirements) Regulations 2011 (below) to help explain the difference between, for example, internal and external coverings, party walls or lot boundaries. Subdivision (Registrar’s Requirements) Regulations 2011, s 10(4)(a). These images and formatting tools are simple yet vital inclusions to any legal advice for an Owners Corporation who would prefer to spend their valuable weekends reading anything else. 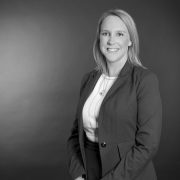 If your Owners Corporation has a legal issue and wants easy to understand legal advice, please contact Nicole Wilde or a member of our Owners Corporation Team. Important Alert: The new Owners Corporations Regulations 2018 (Vic) come into effect on 2 December 2018. Short-stay accommodation law reform in Victoria: Are you aware of the changes? Considering renovating your apartment? Have you checked you legally own it? What is the True Cost of Not Asking the Right Questions at the Right Time? Celebrating over 45 years of premium legal service.